Whether you come in the fall, winter, spring or summer, Mayan Ranch days consist of Cowboy Breakfasts cooked on the open range, horseback riding, hayrides, roping, fishing, hiking through the cedar hills, fossil finding, birdwatching, peacock feather hunting, treks to the dinosaur tracks, country dance lessons, swimming in our Texas-sized pool (not heated), ping-pong, tennis, basketball, volleyball, BBQ’s, Mexican Fiestas, and our famous steak meal. During the colder months, we also offer bonfires and marshmallow roasts. During the summer months, many of our guests choose to stay a week, so we provide a weekly schedule. This weekly schedule is in effect from June 2nd to August 11th, 2019, and subject to change. Before June 2nd and after August 11th, please refer to above paragraph for detailed activities. Regardless of the time of the year, we have a two-night minimum. Sunday: Our opening night celebrates “You” - The Perfect Dude. 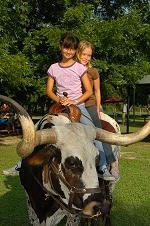 Before supper - introductory horse lesson with Wrangler Ryan, wildlife hayride, and a photo op with a longhorn steer. Menu will be steak and BBQ chicken seasoned with country music. Following supper, Kowgirl Kel’s famous western bingo. Monday: Join us “Way Out West” as we celebrate the biggest Texas screen stars featuring The Magnificent Seven. Head-chef Shawna will be dishing out an array of her western food specialties. Entertainment before supper begins with World-Champion Trick Roper, Kevin Fitzpatrick, who continues to spin his rope world-wide. *Adults & teens have 2 options for supper: Dine with their younger family members at the pavilion with a kid friendly meal -or- dine inside the dining room with Shawna’s superb 7-course meal. All Children 12 yrs. & under will dine at the pavilion with Mayan staff as we make no exceptions for any child in the dining room on this one evening. Children under 6 yrs must have a parent present or arrange for a sitter on this evening. Tuesday: Because there’s a little bit of cowboy in all of us, we will celebrate Continental Cowboy Cuisine at Hicksville with music by “Ricochet the D-Jay.” Before supper - live animal entertainment featuring “Happy Tails.” Following supper, enjoy “Star Gazing” with astronomer Eddie; an unforgettable experience that is both educational and fun. Wednesday: WWW.Wrangler Night.com kicks off with some family friendly competition before supper. Menu will be Tex-Ritter turkey, Cowboys & Indians Tacos, and Cat Ballou catfish. To close the evening, we will have the highly requested “Guest Talent Show.” Special adult Happy Hour will take place before evening festivities. Thursday: Mayan Vaquero Fiesta with Mayan Wine Margaritas, pinata, Senor Ricochet the D-Jay, and the whole enchilada! Bullwhip lessons before supper and live entertainment in the saloon and a hayride with country music will close the evening. Friday: Our trademark night - Mayan BBQ at Hicksville with country music. Before supper, Cowboy Olympics for all ages. To close the evening, a family D-Jay Dance. Saturday: Our #1 night featuring our #1 meal (steaks) with our #1 guests. 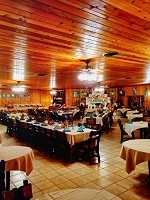 After supper, the mighty Mayan staff will showcase their talent inside the dining room. Sunday: A Texas-sized brunch will be served from 7:45 to 10:45 a.m. featuring a variety of breads, fruit, eggs, bacon, sausage and plenty of Shawna’s specialties. Official check-out: 11:30 a.m. Special reminder: No horse rides, Cowboy Breakfast, or lunch on Sundays during the summer months only.